Marvel's Guardians of the Galaxy Vol. 2 is still shooting in Atlanta, Georgia, with writer-director James Gunn working towards a May 5, 2017 release date. 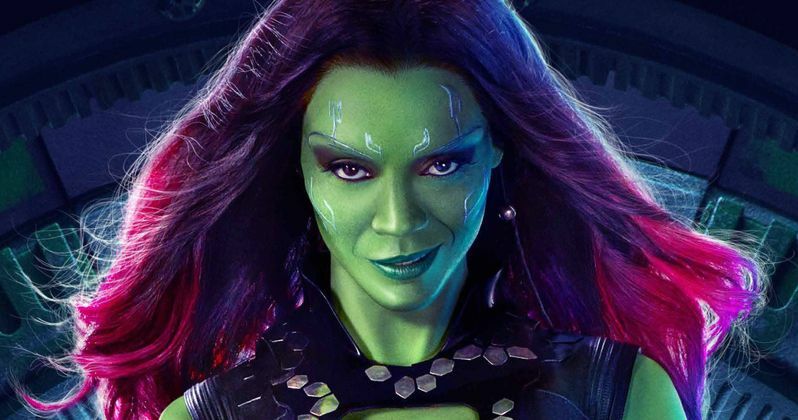 While it isn't known how long the shoot will take place, actress Zoe Saldana recently shared two new set photos from her Facebook page, which features the actress in her iconic green makeup as Gamora. One of the photos clearly shows the actress on board the Milano, while the other is in her trailer. Last week, the sequel made headlines when Disney threatened to pull all future productions out of Georgia after the state legislature passed a discriminatory new bill. If signed into law by the state's governor, Nathan Deal, House Bill 757 will permit faith-based groups and organizations in Georgia to discriminate based on sexuality. Disney has decided that it will no longer bring its big blockbusters to the state. While Disney was the first studio to speak out against the bill, several others followed, including Fox, Time Warner, Netflix, AMC, Lionsgate and many more. These photos come just a few days after Guardians of the Galaxy Vol. 2 star Chris Pratt set up a new Omaze campaign, giving fans a chance to win a trip to the set in Atlanta. One lucky winner will be named an honorary Guardian of the Galaxy and get to hang out with Chris Pratt on the Atlanta set. Fans who donate $10 or more will be eligible for the grand prize, with all of the proceeds benefiting the Lake Stevens Boys & Girls Club in Chris Pratt's hometown. The sequel marks the return of the original Guardians, including Chris Pratt (Jurassic World, Guardians of the Galaxy) as Peter Quill/Star-Lord; Zoe Saldana (Guardians of the Galaxy, Star Trek Into Darkness) as Gamora; Dave Bautista (Spectre, Guardians of the Galaxy) as Drax; Vin Diesel (Guardians of the Galaxy, Furious 7) as the voice of Groot; Bradley Cooper (Joy, American Sniper) as the voice of Rocket; Michael Rooker (Guardians of the Galaxy, Jumper) as Yondu; Karen Gillan (Guardians of the Galaxy, The Big Short) as Nebula; and Sean Gunn (Guardians of the Galaxy, Gilmore Girls) as Kraglin. New cast members include Pom Klementieff (Oldboy), Elizabeth Debicki (The Great Gatsby, Everest), Chris Sullivan (The Knick, The Drop) and Kurt Russell (The Hateful Eight, Furious 7). Very little is known about the Guardians of the Galaxy Vol. 2 story thus far, but writer-director James Gunn has confirmed that fans will learn the identity of Star-Lord's father. Most assume that it's Kurt Russell's mysterious character, but we'll have to wait and see. While we wait for more details as Guardians of the Galaxy Vol. 2 continues production, take a look at the latest set photos courtesy of Zoe Saldana. We also have video from the set which shows the actress singing 'Hello' from the set alongside co-star Chris Pratt.